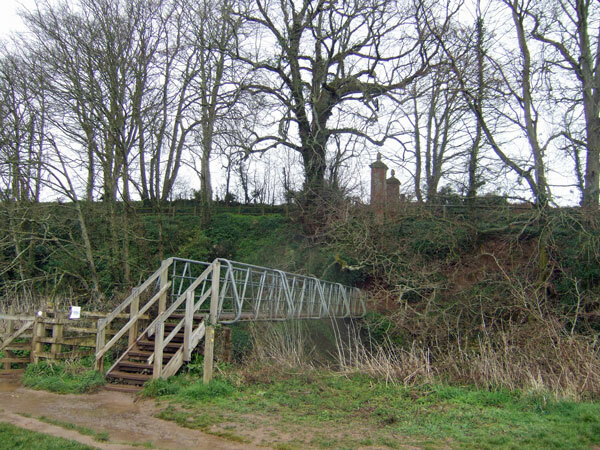 OTTERTON BRIDGES During Saxon times and into the 14th. century the Otter River was too wide to permit the construction of a bridge from the west bank to Otterton village and it was not fordable. For two miles or more up-river from the sea it was about 600 metres wide bounded by the red cliffs we see today. While being very evident on the east bank they appear occasionally on the west side. It is believed that gradual silting of the river had probably begun during or before Saxon times and by 1086 Otterton Mill had been built on a sand spit at the entrance to Otterton harbour. The river had reduced in size and a ferry was in use to cross at this point. A ferryman is mentioned in “Devonshire Transactions” for 1893 which reads “A cottage occupied by Nicholas Passag (meaning ferryman), at or near the mouth of the River Otter”. A field on Anchoring Hill above Otterton is named Firry Anchor. 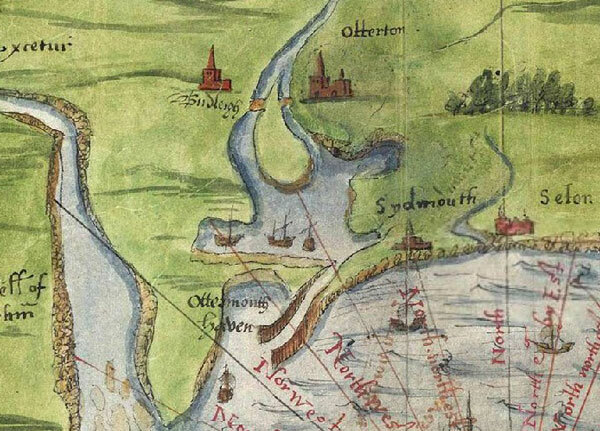 By 1540 “a plan among the papers of Lord Burghley” shows a large island in the centre of the river opposite Otterton and East Budleigh with two bridges linking either shore. It is probable that in due course the western side of the island silted up leaving the bridge on the eastern side at the Mill. 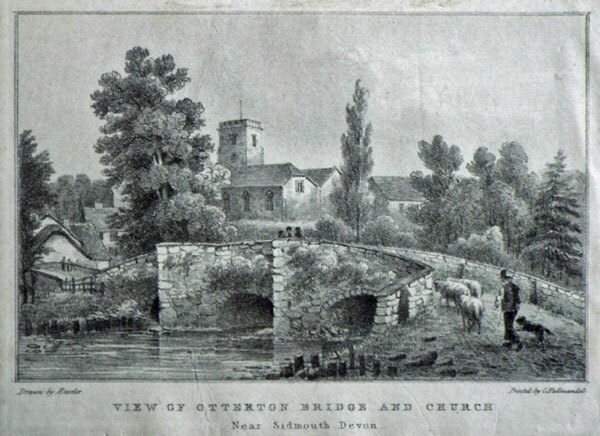 Was this the packhorse bridge illustrated in the 1825 Print?. In September 1808 James Green had been appointed Surveyor of Roads and Bridges for Devon. He was either a pupil or assistant to the famous canal engineer, John Rennie. He was responsible also for building the embankment on the Lower Otter Valley at that time. 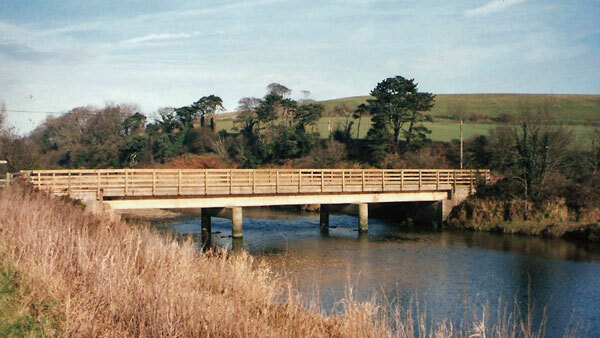 For the next 34 years he was further responsible for 237 bridges in Devon bringing them up to a good standard. Over the River Otter he built bridges at Weston, Fenny Bridges, Gosford, Cadhay, Newton Poppleford and Otterton, all with three span arches, and all have survived exceptional floods, including that of 10th. July 1968. 10 other bridges were swept away at that time. Other serious floods have taken place since that time. 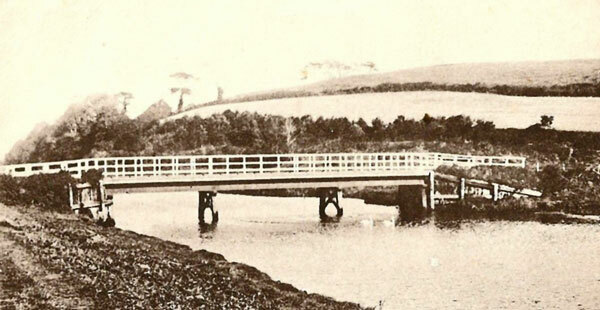 Mr. Green built the present Otterton Bridge in 1827. 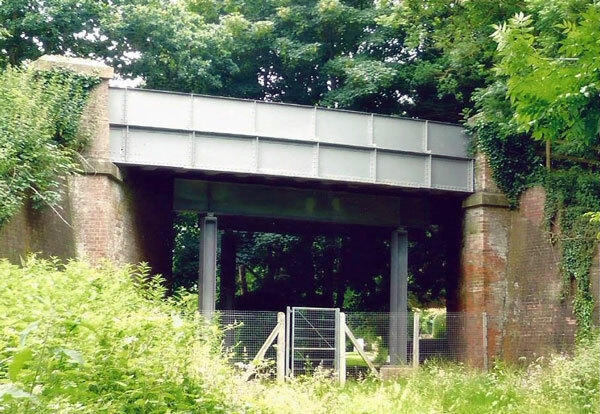 Two further bridges were built to the west when the railway from Budleigh Salterton to Tipton St. Johns was built 1894/97 to help flood waters disperse quickly. 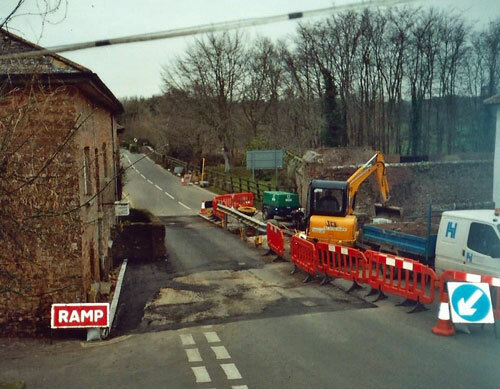 By 1999 due to the use of traffic, especially heavy lorries and farm machinery, the bridge sustained structural damage when the western end subsided by an inch and repairs had to be made. 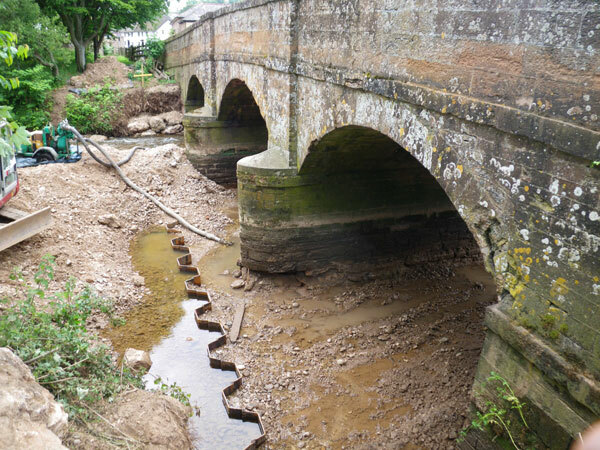 Due to dredging upriver, by 2010 further work had to be carried out to strengthen the bed of the River underneath the bridge piers. A skirt of girders was constructed around the piers. 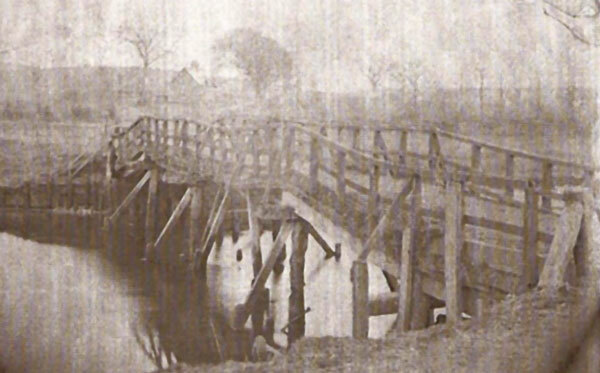 The leat bridge carrying traffic into the village, and the Mill leat, were probably built in the 16th. century. Before this an arrangement of sluices and trunks would have taken water directly off the Otter River to drive the Mill Wheel without impeding access to the harbour. As silting continued and Otterton Harbour gradually silted up completely , becoming unusable, the need for a mill leat became necessary. 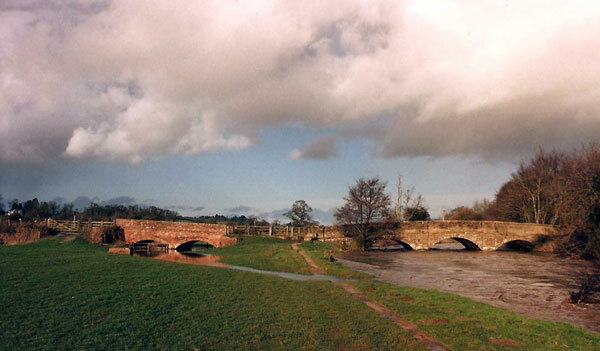 The leat bridge was probably rebuilt when the main bridge was rebuilt in 1827. 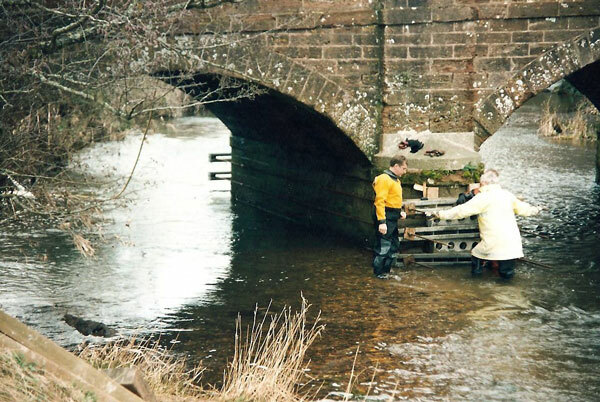 While strengthening the leat bridge in 2003 the Devon Count Council found evidence of an earlier bridge underneath supporting the present bridge. The steel railway bridge was erected over the track in 1896. The road out of Otterton had to be rerouted to bring it close to the entrance to the railway station, which was named “East Budleigh Station”. The railway was closed in 1969 and the station buildings redeveloped as housing. The bridge has been strengthened in recent years to take heavy traffic. The bridge appears in a painting of otterton park by revd.John swete on his perambulations in 1795. It shows a view of the river otter with the warren (hill) in the background and a delightful grouping of trees with a primitive wooden bridge over the river and a lady standing in the middle. The plan drawn up by james green proposing the embankment in 1808 has a brief line drawn across the river at its present day site. 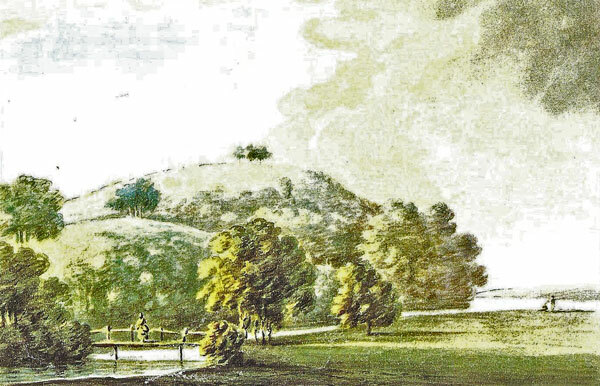 In his letter to lord rolle dated 12th.July 1808, giving his specification for the embankment he states” the budleigh brook, which now runs into the river otter by various channels.........Should be conveyed directly into the river a little below the wood bridge at the park”. The admiralty in its report on the embankment of 1851, marks and names it as clamor(sic) bridge and this is the first use seen of the name of the bridge. It takes its name-clamour- from a field , once part of the colever open-field of the middle ages . It is listed as no.1335 on the otterton tithe award.-arable 4 acres. And is part of a holding known as “ashfords”. The field lies on the high ground above the bridge and to the east of park lane. The other two fields of ashfords were furze hill 2 acres and colever 1acre. It is not known where the name clamour comes from but could be a family name. It does not appear in the various subsidy rolls etc. Of the 16th.Century . 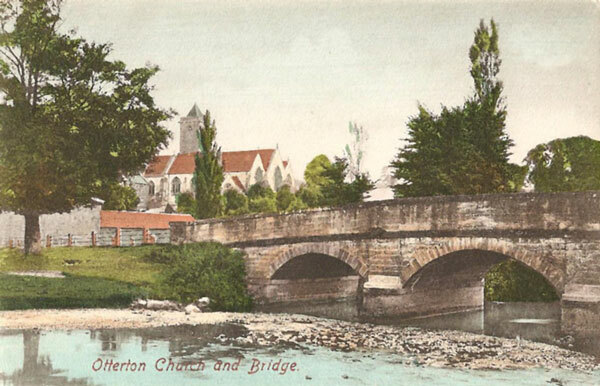 Clamour bridge is not marked on the otterton tithe map. The ashford family are recorded in otterton 1632/1728. Many fields are named after their holders, as are cottages and farms. CLAMOUR BRIDGE, MARCH 2014 Note Pillars above “entrance to Park”. Clamour field to left of pillars. The first bridge known, crossing the River Otter to link South Farm with South Farm Road and Kersbrook to the west is marked on the Otterton Tithe Map 1844.It had probably been built much earlier, as early as the building of South Farm in 1802.